Amber Comes in Many Colors! Have you seen the new multicolor amber jewelry? It is so pretty I just had to share it with you. When people think of amber, they usually think yellow — yellow with very old insects fossilized inside the petrified sap. But, amber actually comes in many different colors (more than 300 in fact! ), some of which are very rare. You’ll see not only various shades of yellow and orange but also gorgeous green, white, red, black and blue , often clear and without the bugs, or maybe with tiny plants, feathers or even little creatures inside. And, some amber even changes color with the light. You’ll find translucent amber and transparent amber too. With all this variety in amber color, you’ll also find gorgeous and very unique multicolored amber jewelry. 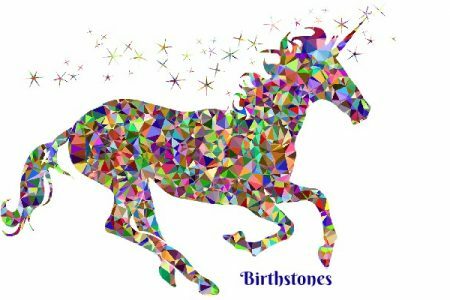 I’ll show you some of my favorite pieces here, including pendants, earrings, rings, bracelets and pins. Enjoy! Tip: If you want to clean your amber jewelry, to keep it sparkling, wash it in warm, soapy water and pat dry with a soft cloth. 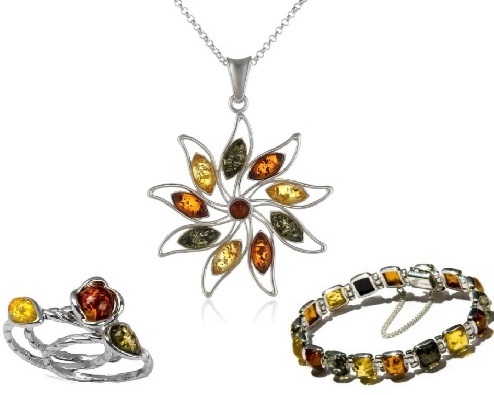 Here are a few amber jewelry sets in a variety of setting styles. As you can see, the settings and cuts of the amber often tends to remind of of the history of amber by resembling sap drops, but it can also be cut into a square, rectangle or even shaped in a perfectly round ball. I am sure you will find something here in your own personal style preference. Of course, you may well be so smitten with Amber, that you just might decide to try a new shape or style and add something really unique to your own jewelry wardrobe. Because it is fossilized resin it is softer than crystal and often contains bits of organic material such as webs, leaves and insects that were caught in it in its liquid state. The best amber comes from the Baltic countries. Ancient Greeks believed it contained sunshine. The oldest dated amber is over 350 million years old. When held in the hand, amber should warm up and give off a slight honey-like odor. Because of it’s texture and it’s ability to warm up, amber beads used to be very popular for teething jewelry for babies. Amber is one of the birthstones for the star sign Taurus. Shining sterling with beautiful honey, lemon and green amber in a delicate but prominent pendants. These pendants give us more beautiful ways to set amber and to showcase the unique beauty of each amber stone, while also giving the piece a very unique design. The natural composition of mined amber defines the unique beauty of each piece. When making your selection, please keep in mind that the images shown will have slight differences to the actual stone in texture and color, but the sterling silver setting will be consistent in every piece. Due to the unique quality of amber, each piece will be one-of-a-kind, so the small details in the stones and the shades of the actual pieces may, or likely will, vary somewhat from what you see here. The settings will be the same, but the amber stones will be different. One thing is for sure though, these earrings will be gorgeous. Each of these earrings has eight colored segments. This Sterling Silver Multicolor Amber Rectangular Bangle is fabulous in design, style and color. This colorful amber bracelet is beautiful and unique 360 degrees around. It looks stunning on its own, or you can wear it with other bangles for an amazing look. Day or evening, this is a perfect piece to add to your outfit and your jewelry collection. It also makes a wonderful gift she will LOVE. This bracelet is 7″ in length. Because bracelets do vary in size and because a bangle bracelet is not forgiving when it comes to fit, you will want to measure to make sure you purchase the correct size of bracelet, just like you would a ring. Measure the circumference of you wrist with a piece of string. Lay the string next to a ruler or measuring tape to determine the actual circumference of your wrist. If you are purchasing a bangle bracelet, like shown above, add 1/2″ – 1″ to the length and that will be your bracelet size. Example: My wrist measures 6″, so I add 1″, therefore I wear a size 7 bracelet. You don’t want to add more than 1 inch. Otherwise, you would end up with a bangle bracelet that may well slide right over your hand and off your arm. The Sterling Silver Multicolor Amber Butterfly Pin shows how jewelry designers can emulate the variety of color we see in insects and in fact, all of nature. Sometimes we don’t even realize how many different colors we are seeing in nature. We simply enjoy the overall beautiful natural scene before us. This big amber brooch features several gorgeous colors in its wings and body. The sterling silver provides the perfect setting and background for Amber. This pin is sure to catch the light in a big way. Women can never have too many rings! We enjoy owning a variety of rings and being able to select a different one each day that matches our outfits or reflects our mood. These rings show several different styles that compliment Amber. There is even an impressive ring that features a single Amber stone. The set of three rings, or “stacking rings”, can be worn in several different ways and each way would give a different appearance. Each ring could be worn separately as well, which gives us another option for the set.